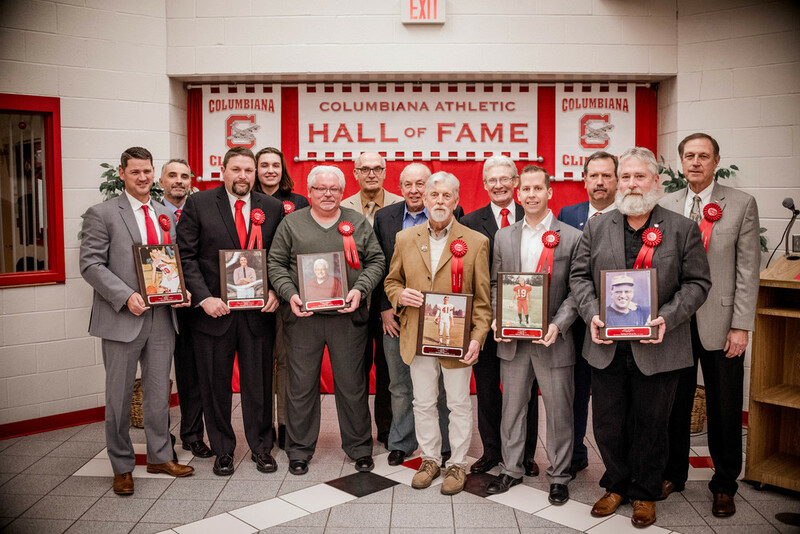 The 2019 Columbiana Hall of Fame was held at CHS, Saturday, January 12th 1019. Inductees pictured in the front row with their presenters in the row behind are shown from left to right: Ian Schmidt (Class of 2001), Presenter coach Jeff Hammond, Rick Clark (Class of 1987), Presenter Jacob Clark, Donald Groubert (Coach and Event Manager), Presenter Andris Balputnis, Tucker Cope (Class of 1964), Presenter Jim Ward, Derek Garrod (Class of 2002), Presenter Brian Pearl, and John Kelton (Deceased, Coach 1972-1984) represented by Jim & George Hinerman, Presenter Joe McPeek. A special thank you to the Columbiana Hall of Fame Committee for hosting another outstanding event for our inductees, presenters, student athletes, families and friends. It was a first class event to welcome back some of Columbiana's finest athletes and coaches which recognized individual, team, and school successes! Congratulations to each of our inductees in the Class of 2019!